Has rosé become more of a brand than a wine? The pink tide is still rising, but for how long? The first time I saw a chalkboard outside a café touting "frosé" I said, "Uh oh." Rosé and I go back a ways. In 2007, I wrote a Wine Spectator cover story that explored a trend of growing sales of high-quality dry rosés and highlighted some of the best examples from around the world. The issue didn't grab much attention, which I like to tell myself means I was ahead of my time. Now, of course, rosé is cool. While overall sales of rosé in the United States dipped 1.8 percent last year, thanks to the slow decline of white Zinfandel, imported rosé sales grew 44 percent, according to Impact Databank. 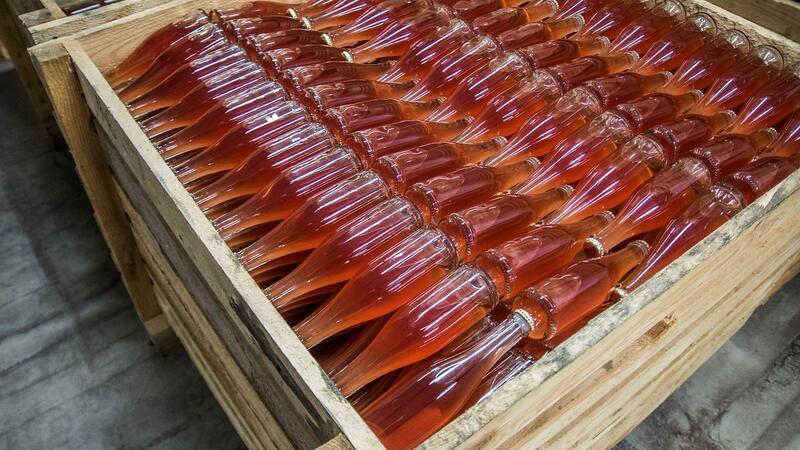 In fact, imported rosé sales have doubled in the past five years. I was happy to see all of this. True quality rosé is beautiful wine. It's a gateway wine—fun, easy and appealing to vinous newbies. Then a wine importer emailed me: "Have you heard anything about a glut of rosé?" He was worried about the category. "I think there is definitely too much supply in the pipeline, and low-cost rosé has impacted our ability to sell quality rosés in the $11 to $14 range." He said that buyers—both the stores he sells to and their customers—don't seem to care whether the rosé is good. If it's pink and cheap, it sells. That's the downside of being fun, easy wine. People think a summer sipper doesn't need to be good, just cheap. That way you don't care if you throw it in a daiquiri machine. Rosé, rather than being a category, is becoming a brand. But the boom has upped rosé's game. A lot of rosé used to be a byproduct, bled from tanks of fermenting red grapes to help make the red wine left behind stronger, with deeper extraction. Now many winemakers see rosé as a goal in itself, and there's a lot of fun they can have with it. Which grapes look best in pink? How long should the wine stay on the skins? That's why we're seeing rosés in all shades on the store shelves. Once there was blush. Now there's onion skin to salmon. It would be a tragedy to see those lovely rosés lose out to cheap pink plonk. What do you think? When you buy rosé, do you look for variety and quality? Are you looking for a rosé that makes you think? Or does it just need to go down easily? By the way, my importer buddy told me I'm behind the times. "Friesling is the new frosé, Mitch." Like so many wines, it seems there's a curve of excitement that follows innovations and improved quality. Then it hits a plateau: everyone wants a piece and the market floods. For me, Provence rosé remains the standard-bearer though I have tasted some good examples from Italy and even Nebbiolo. For me the curve of excitement is more in Italian whites now. White is the new pink. I think that you are asking this question to the wrong audience. Based on my experience, the average reader of the Wine Spectator is someone who enjoys higher quality wines at higher price points than the average consumer who is buying the bulk of the rose (and wine in general) in the US. I love a high quality dry rose, but I would guess that the average consumer is just substituting cheap, sweet rose for cheap, sweet white zinfandel. Our customers are looking for quality first and are suspect of roses that are too cheap. We committed to our roses anticipating that we bought enough to get us through the end of August but at the $11 - $15 price, we ran out around the end of June, scrambling to find alternatives. And as we move to Autumn in New England, it's still a robust segment.